There are two parts to the devotional thoughts today. In line with the author, I agree that we often find ourselves hiding from God when we are sinning or unwilling to repent. Like Adam and Eve, we realize what we’ve done and make the mistake of thinking that God doesn’t see or know, that we can sweep it under the rug, or make it like it never happened. We cannot and any attempts to try to are fool’s errands. But the other side of the hiding story is what kind of retreat am I for those who want to hide? What I mean is this. We hide from our spouse because we are embarrassed, ashamed, arrogant or embittered. We don’t want to deal with the nearly inevitable argument or judgment or have to explain ourselves. Why? Because that’s the kind of retreat our spouse seems to us. It was so important to me to marry a man who I felt would not retreat away from me, but to me. While we were dating, we had long, sometimes painful conversations about our past, our hopes and dreams, our failures and our fears. It’s not easy to confess to those things because of a hundred reasons, mostly starting with fear of rejection. What if he can’t handle what I’m saying? What if he decides I’m too messed up or too needy or too insecure? It occurred to me early on that if he couldn’t handle it and bailed, then clearly he was NOT the one I wanted to spend all my days with. It’s so obvious. But sometimes we forget this. We think that we have to pretty up and be as near perfect as we can. So I decided that it all has to come to light, let it all hang out. And if he doesn’t run away screaming, we got something to go on here. The reverse was true as well. He had his share of stories to tell. And I purposely listened for his intentions – was he always making excuses for himself? Did he only tell stories that made him look good? Was he honest about facts, even the ones that made him look really bad? Did he blameshift and consistently point fingers at others? When someone wronged him, what kinds of things did he say to describe that person and what was his tone of voice toward that person? These are all tell-tale signs of a heart that does not hide and steps fully into the light. Scars and all. From his gut-wrenching failures to his providential triumphs, he shared, willingly, though sometimes more carefully and haltingly, so much of himself and the man he was, is, and is becoming. This is the man I fell head over heels for. And this is the man I continue to fall for. But I’ll tell you the truth. We have hidden from each other in our first year of marriage. We both lied to each other to avoid conflict. We both failed, intentionally, to talk about matters that were important and pressing. We were afraid and didn’t want to deal with any of it. Like the proverbial head in the sand, we were like ostriches (although I’ve read they don’t actually do this), and continued to avoid the elephant in the room – and any other countless animal metaphors you can use here. We were like beasts basically. Returning to our instincts of self-protection and fear-driven behaviors. Fast forward to now, and something has changed. Through a series of events, God-driven events, we were forced to realize what we started to do, and instead of hiding from each other and making excuses for our behavior, we made a commitment. We committed to being real and honest, 100% of the time. When we struggled, we let on. We didn’t try to be dishonest and seem like we had it all together. But the important part of all that we have learned in our first two years of marriage is this – we need to be safe havens for each other. And thus the question – what kind of retreat are you? Are you someone who opens up her heart, willingly and graciously listening and understanding what her husband is saying to her? Or are you combative, judgmental, refusing to see his side, losing respect for him by degrees? Is there a resolution with you that doesn’t include getting your way? Can you hear painful confessions from him without ridicule and anger, lashing out and punishing him just for being honest? It’s not an easy thing at times. You want everything to be easy. Don’t we all? Relationships aren’t easy. But as many people say, they are worth the mess. And nothing is worth more on this entire earth and all its riches than a strong marriage. I would trade every earthly possession to have the marriage I have for all my days. And so I pray I will always put in the work. That I will always seek to be a safe retreat for my husband, open arms and open mind to receive him. I pray that he will always seek to be a safe retreat for me when the storms of life rage around us. I pray that we will always be honest and not hide the truth and not hide in fear. I wrote this blog last year after facing a difficult sin in my life. It has been one of the hardest realizations I have had to deal with, and it was painful and still can be at times. But I have come to know Grace even more than before, if that was even possible (and of course it is). In the midst of my confessing my sins, these things occurred to me about the way we become safe retreats for others who so desperately need them. I pray that God’s people will learn to be safe, to learn to extend the grace that has been so lavishly poured out on us, so that all may come through our doors and find hope and rest and love there. 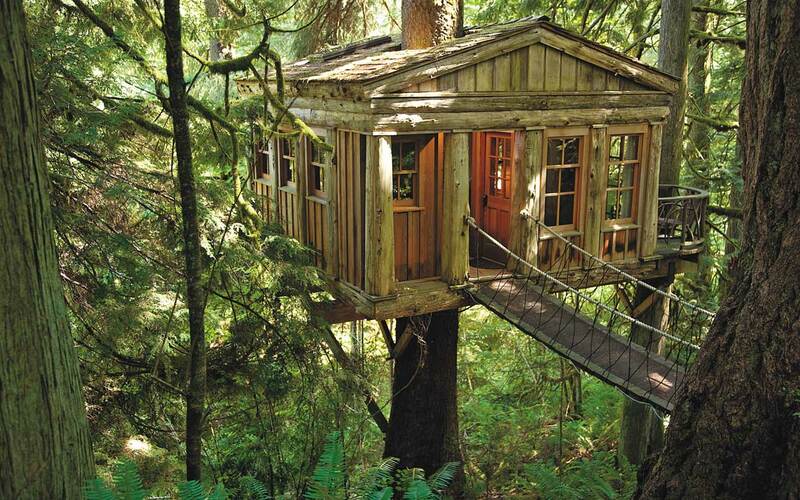 a treehouse hide-out – wouldn’t mind hiding here!